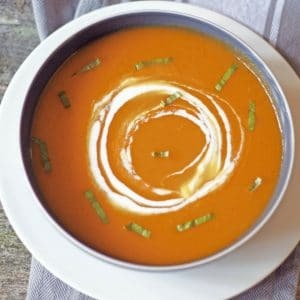 Healthy Creamless Roasted Butternut Squash Soup is easy to prepare and fills you up on a cool day! This butternut squash soup is vegan, gluten-free, paleo friendly, and Whole30! Freezes well too! Add this to any meal plan weekly menu too! We had a ridiculously busy few days and my family is working a lot of hours! Whether on a sports field, TV studio, restaurant, or school they are busy, tired, and hungry! There is also a lot of germs flying around and this is when I focus on making sure there are a lot antioxidant filled veggies into as many meals as possible! 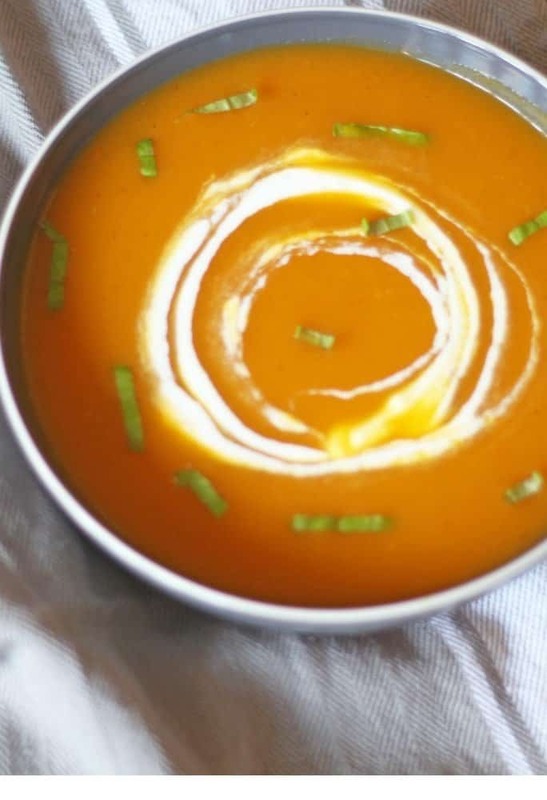 Thus one of my family favorites is this super healthy creamless roasted butternut squash soup! A keeper, people, actually a no-brainer and super tasty! I have been making this recipe for years with many different versions! Roasting butternut squash with a little coconut oil and seasoning adds a lot of flavor to the squash! I then add the roasted squash to veggie stock, seasoning, and herbs to make a delicious creamless butternut squash soup! This is an awesome veggie to keep your blood pressure in a check! Loaded with Vitamin A which helps maintain skin and hair! Dietary fiber can boost the immune system and prevent inflammation. Weight loss, who isn’t always looking to keep their weight in check. This soup is super hearty and ridiculously low in calories and fat! You can pin the recipe HERE! I’d love for you to follow me on Pinterest! I’m always pinning from amazing bloggers! 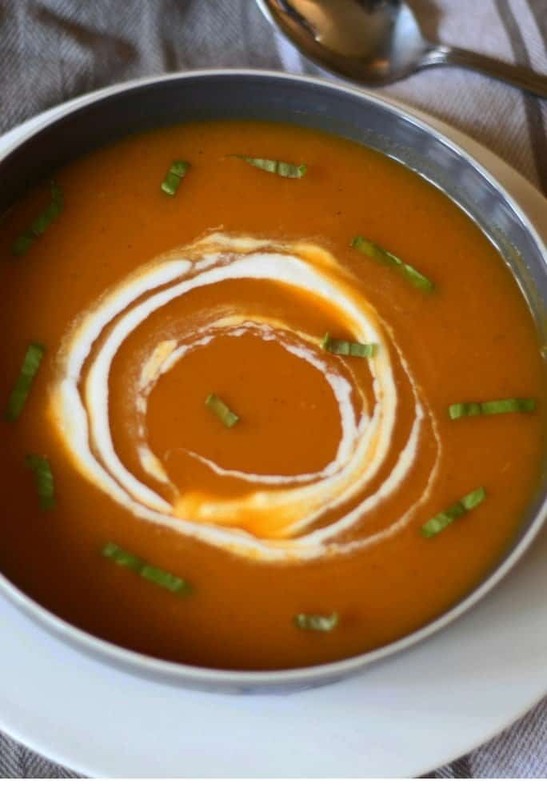 I’d love for everyone to make this yummy Healthy Creamless Roasted Butternut Squash Soup! I’d love to hear how you enjoyed the recipe! So let me know here by leaving a comment! It’s always great when you share your recipe on Instagram! Use #everydayeileen, so I can see and share your recipes! A healthy cream-less roasted butternut squash soup that is vegan, paleo, whole 30 soup that is great for any day of the week. Roasting the butternut squash adds wonderful flavor to the soup. 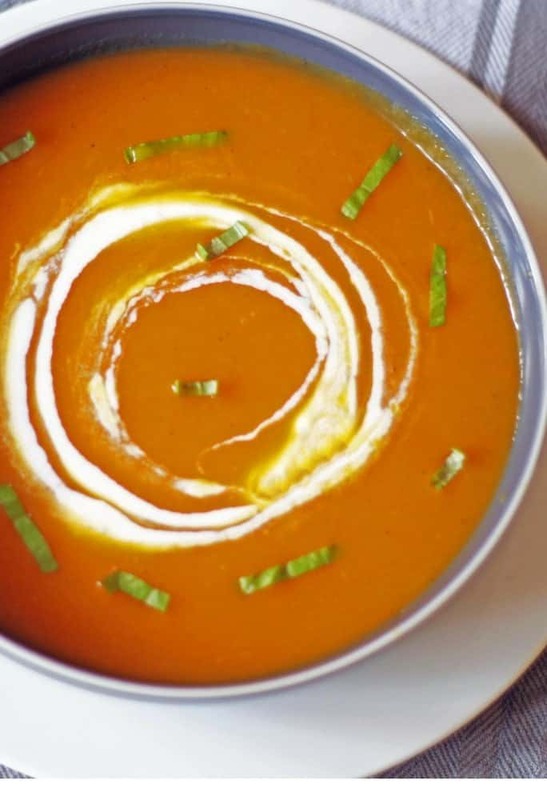 Pureeing the soup adds a creamy texture without adding calories. Perfect for Thanksgiving and any Holiday celebration. Freezes well! To the flesh of the sliced butternut squash, drizzle and blend the coconut oil. Season with salt and pepper, to taste. Place both pieces of squash, flesh side down onto a cookie sheet. Place in oven and cook 45 minutes. Check for doneness. The fork should insert into butternut squash flesh easily. If not done, check every 5 minutes for doneness. Remove from oven. Let cool slightly. Remove the flesh and discard the skin of the butternut squash. Set the butternut squash flesh aside until ready to add to soup. In a large Dutch Oven, over medium heat, add a teaspoon of coconut oil. Add the carrots, celery, and onion. Saute for about 5 minutes to soften the vegetables. Add in and saute the garlic for another minute. Use an immersion blender to blend the soup until smooth. If you do not have an immersion blender. Place half the soup in a blender. place top and cover top with a towel. Hold towel on top and blend until smooth. Do the same with second half of soup. Soup will be ready to serve. This is an easy make-ahead soup. Can re-heat on the second day. Also perfect as a make-ahead soup. Freezes well, I prefer no longer than 3 months. Defrost in the fridge. Reheat and enjoy. I made this soup today and oh woww it tastes devine! The squash is sweet and i didnt have to add much seasoning ? Adlynn, I am so happy you enjoy the soup recipe! I thank you for taking the time to leave me a comment and such a lovely compliment for my soup! We made a double recipe for the big storm this weekend/ superb! Trish, I am so glad you enjoyed the soup! I hope the storm wasn’t too bad!